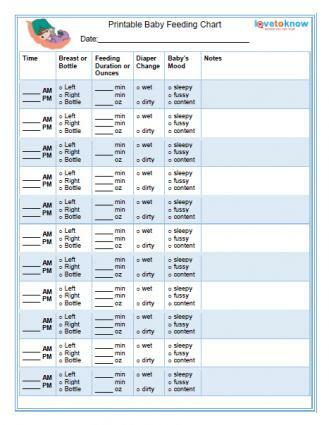 Click to print this feeding chart. New moms have so many things to worry about, but feeding your new infant doesn't have to be one of them. With this handy chart, you can easily keep track of your little one's eating habits. Because your little one will eat several times each day, it's a good idea to print out a stack of them and put them all in a three ring binder. That way you don't have to remember to print a new one every day. Once the stack starts to thin, print several more copies so you're never stuck without one. First, record the time of day. According to Kids Health, babies eat anywhere from 8 to 12 times each day, so having an idea of how long it has been since his last feeding, can help you figure out if it's time to eat again. This is especially valuable for night feedings as they can blur together and cause you to lose track of your schedule. Next, mark which breast you fed on and for how long your baby nursed. This is helpful because you can alternate starting sides to be sure your baby is completely emptying your breasts several times each day. The average feeding lasts about 15 to 20 minutes per side, according to the Office on Women's Health, or OWH. If you offer your baby breast milk or formula in a bottle, record how many ounces he ate. If your baby has other caregivers, it's a good idea to get them involved in keeping the chart up to date. That way, when you get home you'll know when and how much your baby ate so you can be ready when hunger strikes again. Next, record whether your little one had a wet diaper at feeding time. Four to six wet diapers a day indicate that your baby is likely getting enough to eat, note the experts at Kids Health. By keeping track of your baby's habits, it'll be easy to notice if things change. Record your baby's mood after feeding time. This is helpful for detecting a pattern to his days that can assist you in anticipating his needs. Finally, note anything that seems important. This section can be used to note any troubles the baby has while nursing, foods you ate to see if anything in your diet is contributing to crankiness, or anything else you think is important. Being a mom means you probably set something down and then can't find it. It happens to everyone. That's why it's a good idea to decide on a specific location for your chart so that you always know where it is. Once your baby is finished eating, fill out the chart and put it back so you don't have to hunt it down next time you feed.